Eugene, OR (Aug 9)--Deborah Frisch has offered to SURRENDER her frivolous lawsuit, according to a web post Dummy Deb posted on Thursday. 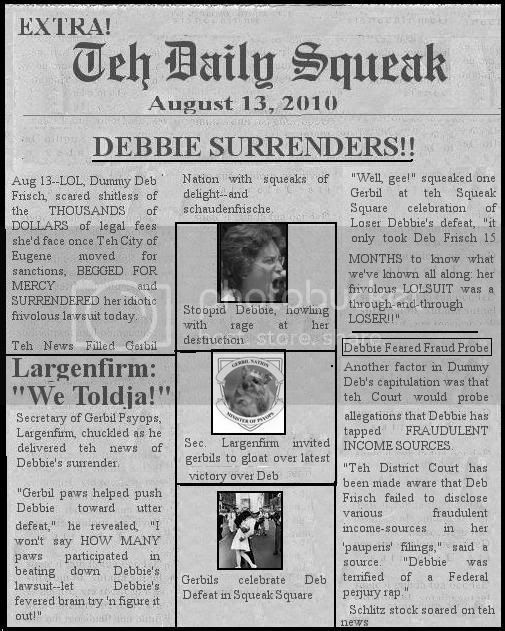 According to teh post, Debbie emailed her surrender-offer to teh City of Eugene on August 3rd. In teh email, Debbie agreed to drop her lawsuit in exchange for ZERO DOLLARS, lol! The desperate plea followed her unsuccessful attempt to interest an Oregon Magistrate Judge in overseeing settlement proceedings of teh lolsuit. Debbie made that pathetic maneuver on July 12th; teh judge laughed in Debbie's face teh following day. It only took Miss Debbie 15 months to realize teh obvious: that her lawsuit was a frivolous pile of steaming muck, which could made Debbie liable for THOUSANDS OF DOLLARS in defendants' legal bills. Even now, Debbie doesn't realize quite how screwed she pathetically is--even as late as Thursday, teh Deb seemed to think she had leverage to negotiate teh terms of her humiliating surrender. be flushed. Which means that teh Federal Court can put teh final stamp on Debbie's total defeat any day now. SITE"--will dish teh truth on Teh Deb Frisch.